The coatings or finishes options on timber flooring these days is vast. And oak flooring is not exception. Timber flooring coatings have come a long way especially in the past decade. Below is a list of the most common coating options available on oak engineered timber floorboards today and our experience with them. We have seen this type of coating being available in Australia for approx. 10 years now. UV cured coatings are sprayed on the oak floorboard in the factory then with UV light curing the coating. The main benefit you get from this coating is a nice matt finish that also highlights the grain. However, if only a thin coat of UV cured coating is applied it can tend to be a little porous. You just have to make sure you get a UV cured coating that has a nice liberal coat on it. This coating is also a good coating to do spot maintenance on scratches etc. The Natural Oil coating is probably the oldest way engineered oak floorboards have been coated. Most times this coating is just brushed on in the factory and once installed is recommended to have another coating buffed in before use. This coating allows the user to have a nice matt finish but can also need to many coats of oil re applied on a regular basis and can be a little more porous than other coating options. This new coating on the market seems to have many benefits from our experience with it over the past few years. It is a factory coat that, like the UV Cured coat, aids to bring out the nice wire brushing finish to oak timber flooring but with a slightly higher gloss level. We have found this coating to be a little more moisture resistant than the two other coating options above but is a bit more involved to do spot repairs. We have found it a very good coating to maintain a good level of matt finish and longevity. Like many things one coating option may not suit all people. It is best to inspect the finished floorboard to see the coating finish and test it out to see if it fits with your desired outcome. Also speak with your flooring professional about the best cleaning product to use on your chosen oak flooring’s coating. 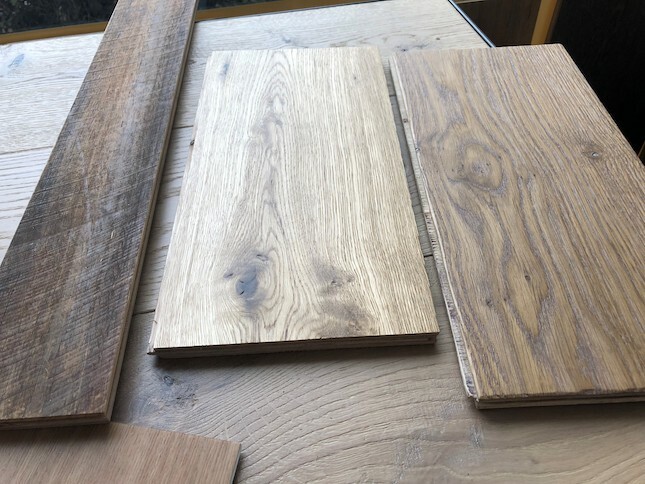 Other options that you might consider when choosing your next timber floorboards suitability for your home would include a flat or textured finish, colour, and having a degree of natural timber features like knots and gum veins in your floorboards. We have oak floorboards with all the above coatings on display here at our large Melbourne showroom. If you are looking to purchase timber flooring for your home and want advice from a company that has been supplying timber flooring for over 40 years feel free to come in and visit us in our large showroom at 312a Bay Rd Cheltenham. We are open 7 days a week.